On a positive note, one type of SpamBOT appears to have been either removed or greatly downsized in its use on the Gnutella network. This is probably due to the network population having shrunk considerably in size over this decade. But possibly also in small part due to my efforts back in 2014 (also thanks to Bigjx) to have WireShare armed with blocking such SpamBOTs at 3 levels, one of which includes using the hostiles security file thus rendering such SpamBOTs powerless on the greater population of the network. Normally whilst using Phex in ultrapeer mode there would be a SpamBOT attempting to connect once every 1 to 3 minutes. But over past two weeks have not seen any. Nor have I seen any appear on GWC’s. At least one type of GWC now blocks such SpamBOTs reducing their ability to find hosts to connect with. My last finding of these type of SpamBOTs was via using Gnucleus and only via finding them on the host file in July and prior to that via a GWC in May. Edit: Still getting block hits for a few previously active spambots, but not many. Edit November: Well, the SpamBOTs are still around after all. Perhaps in smaller numbers. There are still other types of active BOTs on the network. Browse and download BOTs for example. 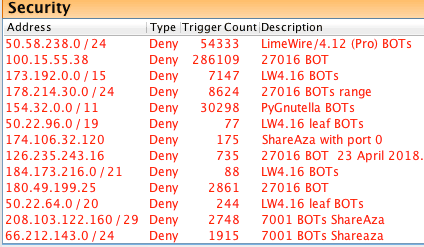 Some identify as standard programs, an example such as a BOT that identifies itself as LW 4.16 (fake as it lacks a minor version) that connects in leaf mode and found in various ip ranges. The Japanese Browse-BOT is a Cabos version that also only connects as a leaf. Neither of these give file-share data which suggests they are either firewalled or not wired to pass such information to the network. There’s also the Trend Micro black hat bot which is more of a generic BOT in that it not only attacks and menaces the Gnutella network but anything on the internet, including websites. It is a terrorist BOT. Trend Micro executives (and perhaps also the company's shareholders) should be jailed for operating this damaging BOT that attempts to steal information from any location of the computer. These BOTs can also have a contributing DDoS effect, rendering a website inaccessible. As an example of BOT's still around the network, using Phex I've highlighted some in the following GiF images. The GiF shows the finding in the hosts connection window, then after blocking the blocked hits count after an hour or two, then a few hours later and again a day later. Notice the ShareAza with the same address as the Phex's. Also two Phex's connected via the same port. 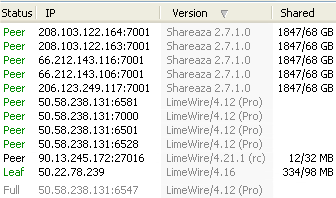 After I removed all these hosts, more Phex's of same address but different ports than shown here connected briefly until I blocked the address. Also shown is a BOT identifying itself as LW4.16. An example of BOTs still around the network in 2017. 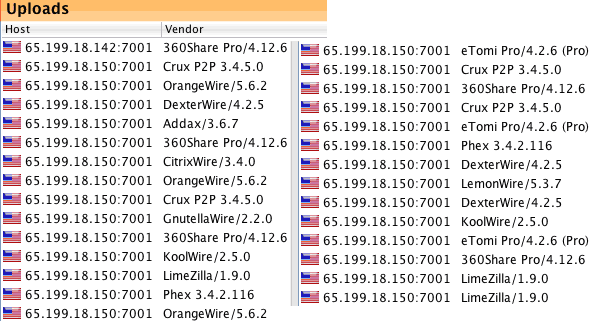 Running BearShare without the hostiles file resulted in a notable number of BOTs connecting. Although I did sew some of these (the 4.12 Pro's) together over about an hour due to them only connecting briefly. Also some of these were downloading from me. Every host shown is a BOT. All those hosts are not what they appear to be, they give fake ID's. The present version of BearShare Hostiles (Jan 2016) is somewhat out of date but will still do a good job of blocking out most BOTs. But unfortunately will also block out a heck of a lot of innocent hosts. Even my own dynamic address has changed to a different blocked range six or so occasions this year (no exaggeration.) I hope I'll be able to release an update over coming weeks or so. Instead of spending a life-time to attempt to update the Hostiles from Jan 8, 2016, a smaller version (used by LimeWire and WireShare) has been converted from CIDR to the Netmask format used by BearShare. 1. The bulk of the original BearShare hostiles is out-of-date, with most of it having been added during the first decade of this century. 2. The internet landscape has changed dramatically over the past 10 years in most countries. New ISPs (internet service providers) have appeared, some larger ISPs have taken over multiple smaller ones. These ISPs have re-allocated many ip address ranges to other purposes such as from business or government to residential. A good example is a very large range that previously belonged to the UK government (pensions dept.) has been divided with UK gov using a half & the remainder split up and shared between residential use in UK, at least 3 European countries and Saudi Arabia. ie: ipv4 ranges have also been changed since last decade with some ranges now used by different countries. Other examples: 146.198.0.0/16, 146.200.0.0/16, 165.120.0.0/16 previously owned in USA now belong to two ISP’s in the UK. ISP's also lease or purchase ip ranges from other ISP's as they need. How many people in the world still have the same ip address to the one they used ten years ago! 3. Last decade probably over 80% of the world's internet addressing system (ip addresses) were Static (never changed.) Whereas these days probably well over 75% of the world's ip addresses are now dynamic (change from anywhere between daily to every couple of years depending on ISP policy applied. In my experience, there's highly dynamic and sticky dynamic; the latter might be based on either 3 or 6 week, 3 or 6 month, one or more years turnaround time; there's also a variable/random dynamic policy used by an ISP in Australia, Austria, Norway & Singapore & probably several others ~ these ip addresses might change from after a day (or a few times a day) up to over 6 months & the ipv4 address lifespan duration changes each time.) I'm not aware of any country that does not now use dynamic addressing for a percentage of residential purposes and that includes every continent and country large or small. 4. Question marks exist over many of the additions to the hostiles file in the first place. Last decade it was the default for most gnutella programs to immediately share downloaded files. Some people (myself included) might not check all files they downloaded for weeks or even months. I greatly suspect many additions to the hostiles file were not BOTs but accidental sharers of bad files. Do hosts accidentally sharing bad files 10+ years ago still deserve to be blocked? I doubt the hosts were really periodically re-checked and removal of hosts made on any consistent note (if at all.) It would have been far too difficult to re-check over half a million blocks representing many, many millions of individual hosts. Some of the logic (post #1 of this thread topic on page 1) about updating virus/malware scanners, etc. was barely applicable for those using MacOSX, not to mention an odd logic in any case. 5. Some organisations involved in spamming or investigating the network last decade have since stopped, either replaced with new ones or never replaced. Edit 2018-04-29: I've personally found my own unique dynamic ip address within a range block on the hostiles more than a dozen occasions over the past 15 months and more than this over past 3 years despite removing the blocked range or part of it each time. The newer hostiles is smaller but no less effective. The biggest plus is now you will be able to connect to more innocent hosts (faster connecting time) and find more files. The newer hostiles is sized around 29-30,000 hosts compared to the original hostiles of 2011 of over half a million or the 2016 version of 430,000. Regular BearShare users will find the program quite noticeably starts up much faster than previously as the hostiles is loaded (previously it could take 10 to 20 seconds depending on computer.) Whilst the full-Japanese hostiles version has been retained, it is definitely not recommended. Using this will definitely slow your connections to the gnutella network, and besides, you might also be losing out on finding files. They share both local & international content. There is also a Super-Light hostiles option. This file only contains hostiles found over the past 5 or so years & have still been active hostiles over the past year (around 1,800.) I made some effort to avoid adding hostile hosts that change their addresses frequently. The Super-Light hostiles is 6% the size of the new but larger hostiles and around 0.3% the size of the BearShare hostiles of previous years. runt66 and sleepybear91 like this. I periodically like to remind people about BOTs on the Gnutella network. I set-up Phex on a different OS to usual and recorded a few findings after 24 hours. Some of the same old BOTs still around and of course the port 27016 Spam-BOTs that show up with different addresses periodically. GTK-Gnutella has its own way of blocking BOTs. During the 2014-15 period I helped with the addition of ways to block two BOT types for WireShare. But for all other BOT variations and for all other LIME code based programs including BearShare, the best way to block these hostile hosts is via using a hostiles security block list. Below is a few listings of BOTs seen at moments over a day. The first picture, a connection listing is from two snapshots taken one hour apart. The Phex security block window shows some of the BOT block rules I set-up and how many times they had been blocked within a 24 hour (or less) period. I've also shown a pic of a connection listing of PyGnutella from Jan 2012 using the same port as the other PyGnutella's still use now. The reason for the range blocks is because each range belongs to a particular company and in many cases the BOTs are dispersed across the range.